In Luke 21 there are several references to troubled times. In verse 25 it says nations will be in distress with perplexity suggesting that problems may be so grave, no one knows how to solve them. In verse 26, it refers to men's hearts failing them from fear, especially when they see what may be coming upon them. In this context, the perfect storm is coming. Rahm Emmanuel made the often-quoted statement that we should never let a crisis go to waste. Greece has a crisis. You may think that it is such a small nation that it isn't worth exploring the deeper meaning. The real problem is contagion. 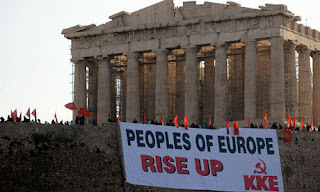 Greece is just one of many socialist nations in Europe. Thus, Greece has been funding massive social programs and accumulating huge debt. Nations that could follow right behind Greece - and soon - include Spain, Portugal, Italy, and Great Britain, among others. All wobbly European nations are hoping the European Union will bail them out of trouble. They may try but the financial issues are so formidable that it will not work. As Gary Bauer of American Values says, "Socialist policies have resulted in a Europe that has been far less than resilient to the economic crisis. Many of the over-spending, over-borrowing and over-expanding European Union governments are heading towards financial bankruptcy and utter collapse. And yet Obama and his allies still insist on remaking America in Europe's crumbling image." Bauer continues, "Europe's fiscal chaos is an affirmation of Thomas Jefferson's axiom that 'a government big enough to give you everything you want is big enough to take away everything you have.' The violence in Greece recently is the inevitable result of too much government. And given the Obama administration's socialist impulses, its addiction to spending and its unflinching devotion to unions, there's no reason to think a Greek tragedy could not happen in America." Greece had no choice but to cut some austerity programs and further tax people. Most of the population of Greece is getting some kind of government benefit. Until the collapse, they could retire at 53. Now the age is raised to 60. The people in that nation had grown dependent on big government and handouts. The free lunch was pulled out from under them and parts of the nation went up in flames with three deaths. This is what happens when the "entitlement mentality" pervades nations. Today Greece, tomorrow America. Debt and deficits are the gifts that keep on destroying! People do not willingly give up benefits, particularly if they have benefited from them for years or decades. Most people are self-focused. They often do not see the long-term damage being done due to these entitlements. And politicians don't seem to think about the consequences either. They are busy buying votes that always come with hand-outs. America should be paying very close attention to socialist Europe. This is exactly what the movers and shakers in Washington and around the world want to see America become. We may honor their wishes. Our unfunded liabilities exceed $100 trillion. Yes, that's trillion with a "t". The inevitable outcome of the Obama administration spending will be either bankruptcy or austerity. It will likely be both but the cutting of entitlements will likely produce the same kind of chaos that we saw in Greece this spring. Since President Lyndon Johnson, we have doled out trillions of dollars making millions of people dependent on big government. By now, they know of no other lifestyle. If it is yanked, these people will not go quietly into the night. Capitalism is not the problem. Handouts and socialism are. What is the deeper meaning here? The world is being bombarded with what the Bible calls "birth pangs." God is trying to get our attention. The world does not understand end-time scenarios so God is trying to wake up the church. We are seeing financial chaos, volcanoes, earthquakes, tornadoes, floods, oil spills - all of disastrous proportion. To solve the financial issues, the world will willingly walk into the one-world system with a one-world currency. Right now both the Euro and the dollar are crumbling. People will be open to a powerful, charismatic man who will tell everyone he can fix it all. The Bible calls him the Antichrist. He will be empowered to do miracles, signs and wonders, and pull rabbits out of hats. This man will be handed the perfect storm referenced above - a crumbling of society on a global scale. As the passage in Luke states, men's hearts will be failing them for fear. While the real fulfillment of such signs is in the Tribulation, we cannot help but see the stage being set for that. This could be a long, hot summer or perhaps the chaos will hold off for another year or two. But we know that it will come. Most nations today are dependent almost exclusively on government and now America is no exception. And Rahm Emmanuel and his associates will not let the scenario go to waste.